Today we’re going to talk about the particular ways to start your day. Over at Lifehacker.com I found and article where they say that the first hour of your morning sets the stage for the entire day to follow. Wow. Let’s sit on that for a second. Think back to this morning. How did you spend your first hour? Hello desk defenders, cubicle champions, open space servicemen, corner office combatants, home den defenders and coffee shop conquerors. 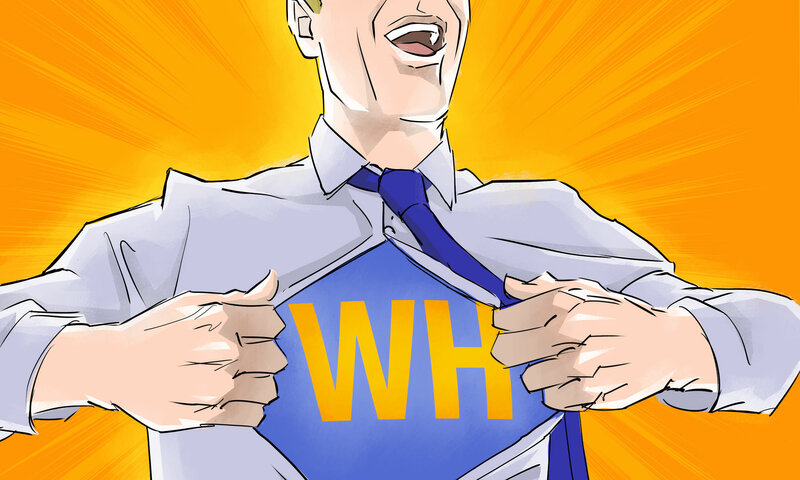 My name is Brock Armstrong and I am… not the Workplace Hero. That’s you! You see, the goal of this podcast is to make you into a Workplace Hero. I am your guide on this journey. Think of me as your auditory custodian. Personally I put my coffee on, went to the bathroom, took mine vitamins, fired up my laptop, grabbed my coffee and spent the rest of the hour responding to some easy/friendly emails and scrolling through endless photos of my friend’s pets on Instagram. Then I headed to the gym. I am not sure how that sets the stage for the rest of my day but I’ve survived this far so… let’s continue. The article went on to say that there’s a better way to start your than what I just described and that is to take the morning to tackle the hardest jobs of the day—those heavy tasks that you are pretty sure you won’t have the mental fortitude for later on. By doing that tough thing – that you may otherwise end of putting off – first thing in the morning, you will feel a large sense of accomplishment to have it done and in the can (as we say in the biz). You can then use that happy feeling to carry you through the day. Recently, conventional wisdom was challenged with something Penn State University refers to as “pre-crastination.” After doing a series of studies in which students pick up and carry one of two buckets, researchers theorized that many people prefer to take care of difficult tasks sooner rather than later. That theory poses the question of whether this new idea of pre-crastination or the more widely acknowledged constructive procrastination is more effective. The research, published in Psychological Science (a journal of the Association for Psychological Science) suggests that people often opt to begin a task as soon as possible just to get it off their plate, even if they have to expend more physical effort to do so. The researchers conducted a total of nine experiments. This is what it looked like: College student participants stood at one end of an alley, along which two plastic beach buckets were stationed. The students were instructed to walk down the alley without stopping and to pick up one of the two buckets and drop it off at the endpoint. The researchers varied the positions of the two buckets relative to the starting point and the students were asked to do “whatever seemed easier” – pick up and carry the left bucket with the left hand or pick up and carry the right bucket with the right hand. In the first three experiments, participants showed an overwhelming tendency to choose whichever bucket had the shorter approach distance, which translated to the longer carrying distance. In case you were wondering, the researchers were able to rule out various potential explanations, including potential problems with hand-foot coordination, left or right handedness and differences in attention, in subsequent experiments. All this without the promise of a nap or a vacation or even a cookie, the subjects simply wanted to experience the “good feeling” of knocking the task of their mental to-do list. Sound familiar? It does to me. It’s likely the same reason that I answer emails first thing in the morning. I know that is off my list and I can concentrate on other my fun and fulfilling tasks. In another laboratory (in a University far far away), behavioural scientists have discovered that one of the most effective ways to create an enjoyable experience is to stack the painful parts of the experience early in the process. Psychologically, we prefer experiences that improve over time. That means it’s better for the annoying parts to happen early in the experience. As a side not they also discovered, not all that surprisingly, we don’t seem to enjoy it when painful experiences are drawn out or repeated. If you’re at the dentist, it’s better to combine the annoyance of waiting into one segment. The wait feels shorter to your brain if you spend 20 minutes in the waiting room rather than spending 10 minutes in the waiting room and 10 minutes alone in the exam room. The scientists also found that people enjoy all-inclusive vacations because they pay one lump sum at the beginning (which is the painful part) and then the rest of the trip is divided into positive experiences, excursions, and parties that kinda feel like they are somehow free. If you’re a project manager you have probably noticed that it is better to give the bad news to your clients first and finish with the good news. Clients will remember an experience more favourably if you don’t start with all the super cool new features you have added and then end with the bummer news that the project is horribly behind schedule and over budget. So, let’s take a normal day where you might have something annoying or painful to do (like writing a proposal) and you also have something you really enjoying doing (like writing a 5-star review for your new favourite podcast). If you write the review on your lunch break and then start the proposal with only an hour left of your workday, you will remember your day as going from a good experience to a bad experience. Obviously that’s the opposite of what you want to remember because your brain likes it when experiences improve as time goes on. Interestingly enough, to us folks who are involved in marketing or sales, the path to a kickass workday resembles the path to a kickass customer experience – it starts with a few painful experiences and improves as you goes until you are happily holding your cool new purchase in your hot little hands. Using this strategy, you allow yourself to move toward happiness even when you know there are annoying or painful things you have to get done. Very much like the people in the bucket experiment or your trip to the dentist, the biggest high you can experience from these tasks is to get them over with. Get them out of the way. Get them off your to-do list. Then you can spend the rest of the day admiring your glistening teeth and knocking the easy stuff off your list. I think this is super interesting stuff and definitely worth trying out. You’re homework for this week: Pick three big things that need to get done each day, and NO MORE (if you choose 100 things, you’ll just pick the easy stuff to avoid the hard things), and put them at the top of your to-do list. Oh and by the way, if you haven’t picked up on this already, you’re going to need to start using a to-do list (we’ll cover how to manage those in a future podcast – I promise). So, pick three big things you need to accomplish and get them done as soon as you possibly can. Do those three things early in the day and then bask in the glow for the remainder of the day. Whatever you do, make sure your first hour is well spent— if you do it right, it may be the most productive hour you have. That’s it for today. If you are enjoying this podcast, connect with me on Facebook, Twitter, Instagram, LinkedIn or the podcast website www.workplacehero.me. Because according to a recent study by Evolv (in which they monitored hundreds of metrics from Fortune 500 companies) there is an exciting correlation between usage of social networks and productivity/output per employee. They found that Employees who belonged to more than five social networks had a 1.6 percent higher sales conversion than their counterparts and a 2.8 percent lower average call time. See! You will be more productive if you engage with me on more than one social media platform. But if you only choose one, please make it giving this podcast a review and rating on iTunes, Stitcher, YouTube or TuneIn or where ever else you happen to be listening. Workplace Hero is researched, written, narrated, and recorded by me Brock Armstrong in Vancouver Canada. Additional research, social media, editing and Vocal Fry by Eleanor Cohen. Logo by Ken Cunningham. Music is courtesy my old band, The Irregular Heartbeats. Today’s Heroic topic came from Lifehacker, Buffer Social and Penn State University. Previous PostPrevious Who’s the Real Hero?